When I was 25 years old and newly married, I went to The Ashram in Calabasas, California. Known for its hours-long, crack-of-dawn hikes, daily yoga practices, and delicious vegetarian meals, it’s basically the OG of wellness retreats. After my wedding, I’d gained some weight (okay, 20 pounds) and was for the first time struggling to gain control of my eating, which was out of control. I’d read about The Ashram—the all-day exercise, the meager portions—and thought it was just what I needed to reset my habits and start feeling better about myself. The week was just as challenging as it had been billed to be (blisters and caffeine withdrawal included), but what I took home with me, aside from a smaller waistline, was a deepened appreciation of yoga and the power of mindful eating. All the meals were served with chopsticks to keep you from shoveling forkfuls of food into your mouth and really appreciate the flavors and textures of your meal. Now, almost 15 years since my visit and 40 years since its founding, the celebrity wellness mecca has released The Ashram Cookbook: The Way We Eat (Cindy Crawford wrote the foreword, naturally) a gorgeous collection of vegetarian recipes for everything from its famous soups and salads to grain-based dishes, nori rolls, and sweets. There’s also a section filled with dressings, nut-based cheeses and sauces, plus additional notes scattered throughout the book, explaining the specific health benefits of various ingredients. Considering that a week at the retreat will run you $5,500, the cookbook (which costs $50) is a slightly more affordable way to work a little Ashram-style nourishment into your life. Ready for a taste? 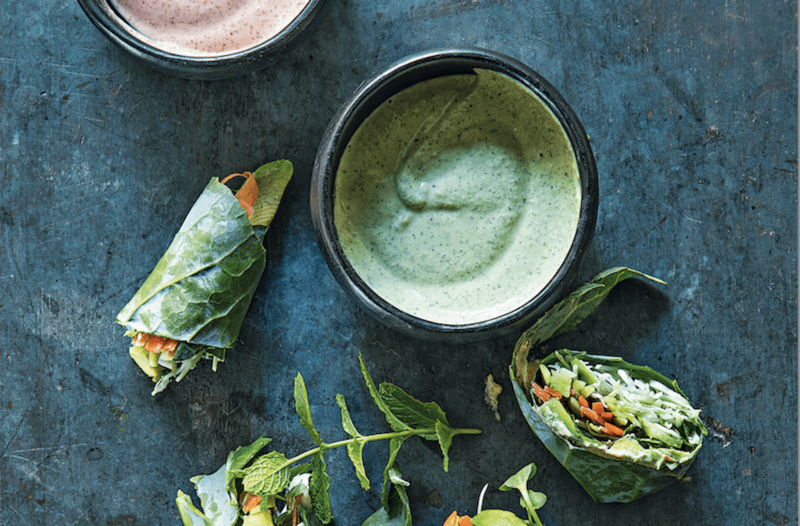 Keep reading to get the recipe for summer rolls with sesame almond sauce and miso shiso cream. The cornerstone of the resort's food program is organic produce, most of which is grown on-property in a meticulously kept garden. As Ashram co-founder Catharina Hedberg writes in her introduction, "The Ashram has been 'farm-to-table' since long before the term existed." Place a large, shallow pan filled with hot water over the lowest possible heat to just keep warm. Place a sheet of rice paper in the hot water to soften, remove as soon as it becomes pliable, and transfer to a moistened cutting board to prevent sticking. Assemble the roll by first laying down one leaf of each herb, so they can be seen through the wrapper. Then cover the herbs with a few shreds of cabbage, add slices of avocado, cucumber, a large pinch of carrot, and a few radish sprouts. Carefully roll up the bundle, folding in the sides like a burrito. Repeat with the remaining sheets of rice paper until all ingredients have been used. Rolls may be sliced in half crosswise or left whole, served with the sesame almond sauce and miso shiso cream for dipping. In a high-power blender, combine all ingredients and puree, first on low then gradually raising the speed to high, until smooth and creamy. Use immediately or transfer to a glass jar with a tight seal and store in the refrigerator for up to one week. In a high-power blender, combine all ingredients and puree, first on low then gradually raising the speed to high, until smooth and creamy. Use immediately or transfer to a glass jar with a tight seal and store in the refrigerator for up to five days. If you're on the hunt for an affordable wellness retreat, check out these 11 getaways that cost less than $1,000. And for more summer roll ideas, check out these 8 super-yum recipes.